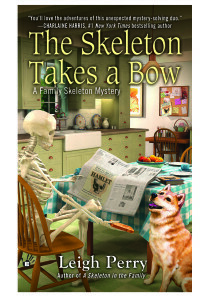 The Skeleton Takes a Bow is the second book in Leigh Perry’s Family Skeleton series. As with the first book released last year (A Skeleton in the Family), this new paperback original is a light-hearted cozy style mystery with slight paranormal overtones (ie. Sid the Skeleton is an ambulatory skeleton who can talk). Beyond that, it remains a rather traditional mystery with great characters, interesting subplots and a satisfying mystery. Now that Georgia Thackery’s daughter, Madison, knows that they have a “living” skeleton sharing their house, things have started to get back to normal – if by normal, you mean taking Sid the Skeleton’s skull to school so that he can play the role of Yorick in their production of Hamlet. Madison has adjusted to having Sid around, but both she and Sid are still dealing with the idea that neither of them gets as much alone time with Georgia as they might like. However, things could always be worse – as they all quickly find out. One afternoon, Madison forgets to bring Sid’s skull home with her and while he is trapped in the school auditorium, Sid overhears a murder. Unable to move without the rest of his bones, Sid cannot see either the victim or the perpetrator, but he is convinced of what happened and coerces Georgia and Madison into helping him begin an investigation. With no dead body found, first they have to determine who died and then they can go about figuring out who did it. As with the first book in the series, Leigh Perry uses the background setting of the story to explore issues that face adjunct professors at community colleges. In this novel, the main issue addressed is the lack of monies available for adjuncts to attend conferences at which they may be able to improve their career outlook. This very real problem could simply have been a passing comment, but Perry manages to make it not only interesting, but also an important part of the mystery. Another subplot that is very timely and effectively used is the debate over standardized testing. When Georgia is tapped to cover an SAT prep course at Madison’s school, this development opens up various avenues for the team’s murder investigation to explore. And along with those productive avenues are big wide highways of opportunities for trouble with a capital T.
Even amongst all of this seriousness, Leigh Perry manages to infuse her story with vast amounts of humor. Perry (and her alter-ego, Toni L.P. Kelner) excel at getting readers to smile and laugh, so fans will expect nothing less. The mother-daughter relationship that Perry describes is equally well rendered and fans will delight in the return of Georgia’s less-than-supportive sister and the odd-ball collection of fellow adjuncts who populate her small-town world. Best of all is the fact that The Skeleton Takes a Bow proves that Sid the Skeleton has legs and we should be seeing more stories about him and the Thackery clan in the near future. _____________________________________________________________________ Disclaimer: A print galley of this title were provided to BOLO Books by the author and publisher. No review was promised and the above is an unbiased review of the novel.